Disney has stirred controversy by having their first black princess, from the movie “The Princess and The Frog,” promote a watermelon flavored candy. In the US there is a long held and unflattering stereotype surrounding watermelons and black culture. In the past (and, uncomfortably, sometimes in more recent times), watermelons have been featured in denigrating images of black people. The Society Pages has a post with examples (warning: some foul language in their comment section). Disney have been accused of stereotyping races before. In many of their older films it was very blatant. But many feel that the stereotyping continues in their modern day films. For example, in “The Princess and The Frog,” released on 2009, the lead character was originally to be named ‘Maddy’ (similar to the derogatory term ‘mammy’) and was to work as a maid. Her name was later changed to Tiana and she became a waitress. Can you imagine a ‘Princess Maddy’? eh. Considering that Disney has been accused of stereotyping in the past, it seems like something like this just wouldn’t happen. 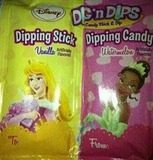 But Disney apparently allowed the use of Tiana’s image to promote watermelon flavored “Dips ‘n Dig” candy, as can be seen in this image, which has been widely circulated on the web today. It shows two flavors, on the vanilla side is the white Princess Aurora from Sleeping Beauty. On the watermelon side is Disney’s first-ever black princess, Princess Tiana. The candy appears to be seasonal, geared toward Valentine’s Day. It is unclear in any of the coverage just when it was released. It should be noted that Dig ‘n Dips candy comes with a wide variety of popular children’s characters on the packaging, including Spiderman, Captain America, various other Disney princesses and fairies, Phineas and Ferb, SpongeBob Squarepants and others. This story is not ‘done,’ we expect updates throughout the week. Disney has not made any public comments concerning the controversy. Nor has the candy’s manufacturer, Pennsylvania based Frankford Candy. But we have contacted the company and will update this story as additional information comes in.